To avoid that they injure people, the fangs of the bears and claws are filed down or broken. As a result, he is maimed for life. Without (corner) teeth he cannot go back to the wild. To the young bears with a glowing punch a hole is drilled through the nose or palate. Trough the fresh wound a rope (or ring) is pulled. There is no money wasted on anesthesia. The hole is made in the muzzle, because that is the most sensitive part of the body. 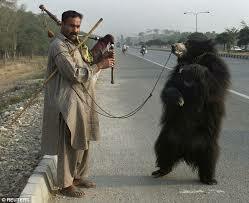 If the trainer pulls on the rope the bear of pure pain will stand upright. Insufficient and inadequate nutrition are rife. Dancing bears also have a long and sad history in Bulgaria. The owners are mostly Roma, an ethnic group in Bulgaria, for whom keeping dancing bears is a source of income and a family tradition. Learning to dance is done by always using the same music and leading the bear on hot coals. Not (too much) to burn every turn he will raise a paw. By this conditioning he does later so on only music without coals. By various actions the use would be greatly reduced everywhere. Can we hope for. Did you really not found any way to learn your husband to dance... ?